On 29th August 2017 I was leading a Highland Council Ranger walk up Suilven. We were picking our way slowly up the path in the steep gulley high on the north side (NC158183), when one member of the twelve-strong group noticed an unusual fungus. We were all probably concentrating hard on where we were putting our feet, which may have helped. There was just one cluster of branched clubs about 5cm high and it was its stunning colour that stood out, a sort of pinkish-violet. The branches appeared to have blunt tips and this one looked like it has been partially nibbled by a snail or slug. I was called back to admire it and was able to take a photo on my mobile phone. This specimen was growing in the middle of the path in an area of steep, stony grassland with low-growing herbs such as tormentil, in a part of the hill that is quite rich in flowers, including species such as yellow saxifrage and dwarf cornel. Back home later I consulted my fungi books and checked online. 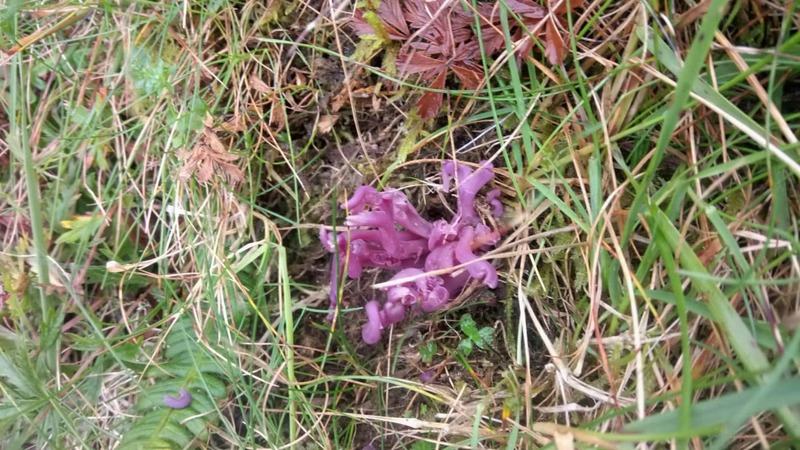 Based on the very unusual colour, and strange fragile tubular branches coming straight out of the ground, I came to the conclusion that it might be the Violet Coral Clavaria zollingeri, for which there appear to be only a very few, if any, records in Highland Scotland north of Inverness. My photo was sent on to Bruce Ing, our local, and eminent, mycologist who lives just north of Ullapool, and he was able to confirm my provisional identification. Moreover he said that he had only once before come across it, in over sixty years, on the lawn of a 16th century house in Wales! Violet coral fungi are described as saprobic – which means it derives its nutrients from breaking down organic material. It is found on unimproved grasslands or with mosses. It is on the red list of threatened species in Great Britain. Which only goes to show the value of taking a photo when you come across anything out of the ordinary and passing it on to an expert, via your local Field Club.